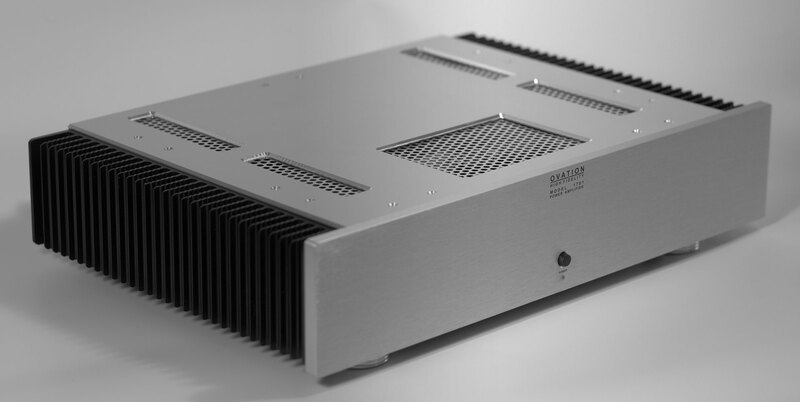 Ovation High Fidelity’s Model 1701 Current Mode Topology (CMT) Stereo Power Amplifier delivers superior imaging, exceptionally transparent mid/high frequency sonics and deep, extended bass performance thanks to a very large, low noise power supply. One of the key design objectives was to ensure the Model 1701 was transparent, open and could reproduce the delicate high notes on cymbals, triangles and violins accurately to preserve the all-important imaging that makes for a realistic listening experience. 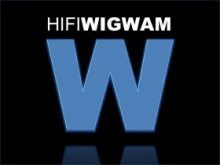 However, accurate, wideband performance without the ability to drive dynamic loudspeaker loads can result in constrained, compressed sound. 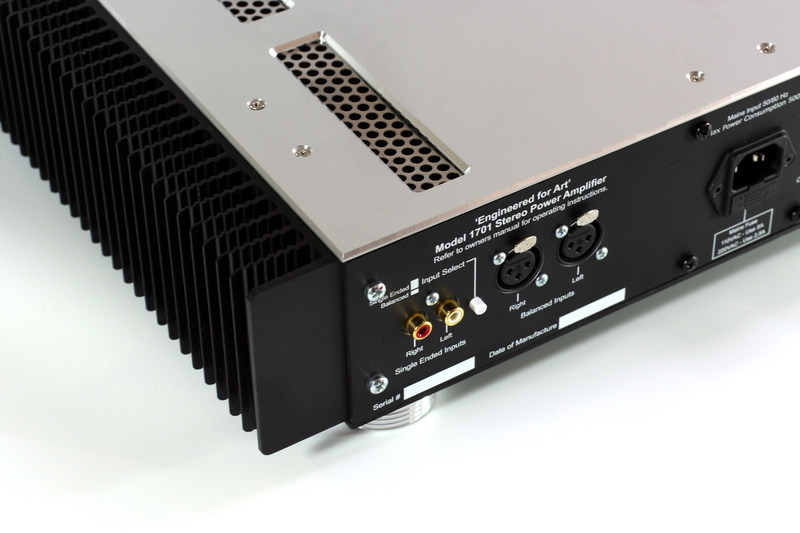 So, the Model 1701 features a hefty output stage for a 100W amplifier and a very large power supply. 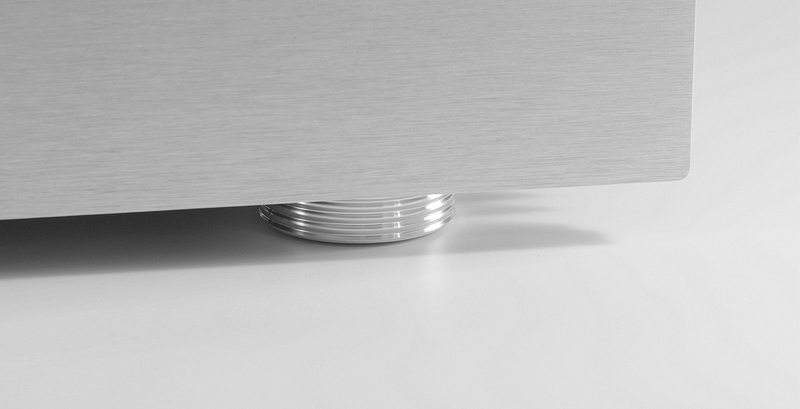 It will drive difficult loudspeakers with ease, and importantly, the distortion is flat not only across most of the audio bandwidth, but also across a widely varying loudspeaker load. 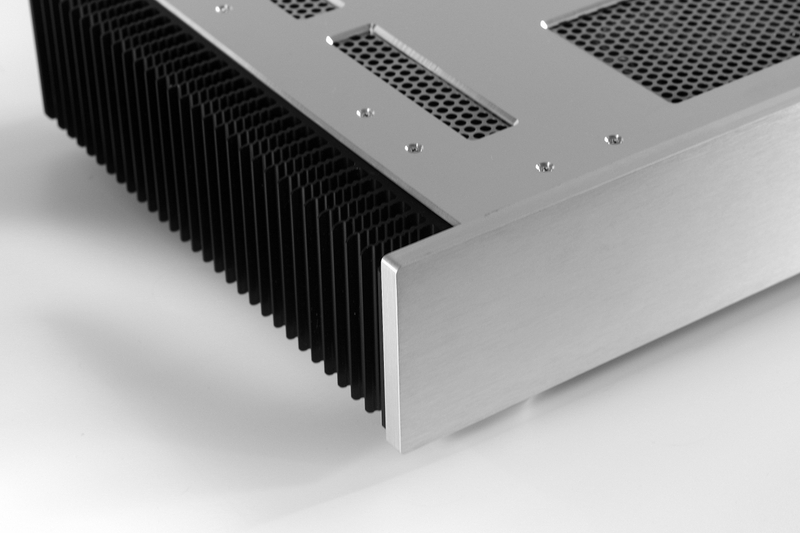 And, each channel of the 1701 has its own large heatsink, which ensures under normal operating conditions, the amplifier only runs warm to the touch. During the development phase, simulation tools are used extensively to optimise amplifier electrical performance, after which subjective listening tests are undertaken. 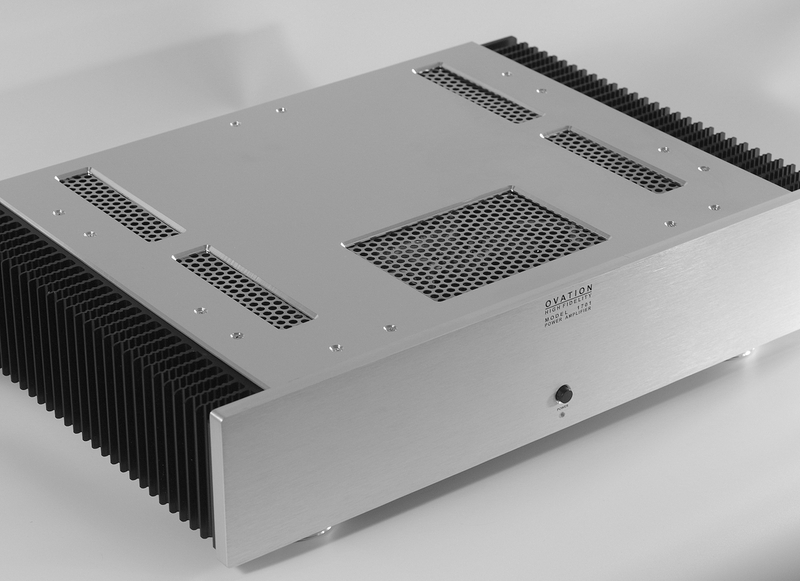 This latter part of the design process will result in tweaks to extract the last bit of sonic performance – the finished amplifier is thus a delicate balancing act between optimum electrical performance and sonics. 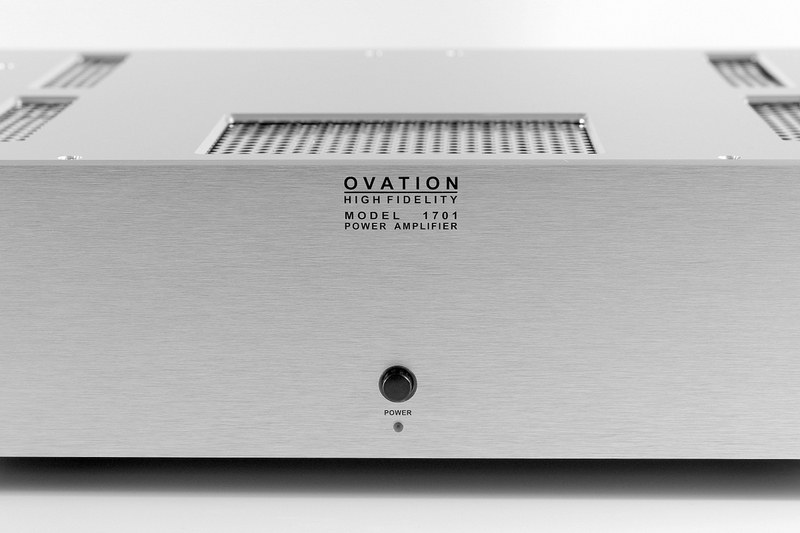 The Ovation High Fidelity Model 1701 Power Amplifier. Engineered for Art. 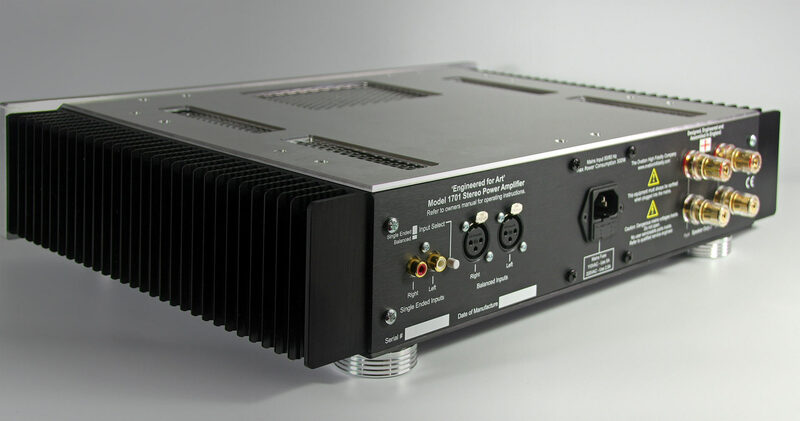 A compact 100 Watt RMS (8 Ohms) per channel all-symmetrical CMT class AB power amplifier that features wide bandwidth, fast rise/fall times and a 500 Watt power supply, allowing it to drive any domestic speaker load up to its rated power. Short term loudspeaker current demands in excess of 20 A per channel are easily supported by means of an output stage that employs 6 matched 250 Watt power transistors per channel and feature exceptional SOA (Safe Operating Area) capability. Careful attention to signal integrity requirements, amplifier and power supply design and PCB layout have resulted in very low distortion and noise. The 500 Watt power transformer is custom wound in England and incorporates an inter-winding screen and a flux band to keep mains noise ingress and radiated EMI within the amplifier chassis to an absolute minimum. A large reservoir capacitor bank, rated at 15% above the highest expected mains voltage, provides huge instantaneous energy reserves that underpin the dynamic performance of this amplifier. Comprehensive non-intrusive protection circuitry monitors the amplifier for DC offsets and overcurrent situations, which if arising, will result in the speakers being instantly disconnected from the amplifier output. 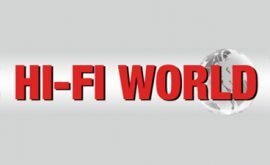 Connection between the amplifier output and the speaker terminals is by means of an innovative solid state relay using ultra-low Rds(on) ‘Trench’ technology MOFET’s with a 200 J energy handling capability. These devices operate at 5~10x the speed and 10x lower ON resistances of the conventional electro-magnetic relays (EMR) used by our competitors. Importantly, our solution suffers no wear out mechanism whatsoever compared to EMR’s. Further protection features include mains switch-on inrush current limiting and loudspeaker muting during power up and power down cycles. 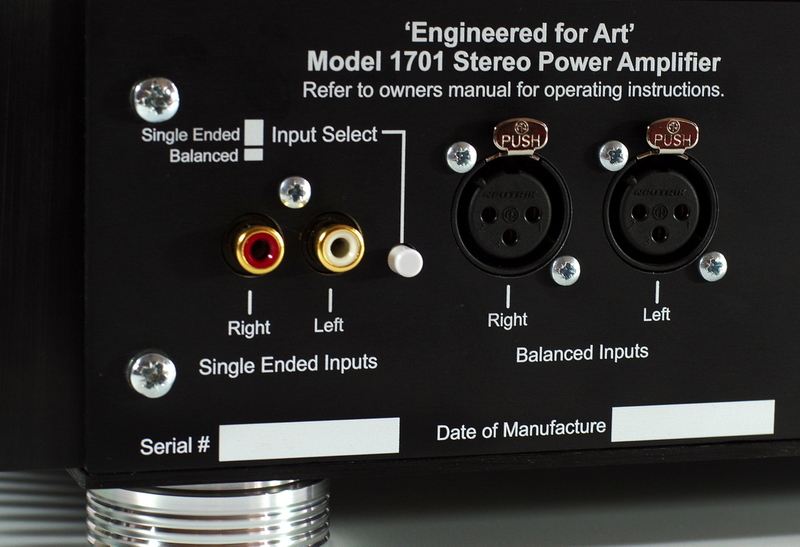 The Model 1701 can accept balanced or single ended inputs which are selected via a push-button switch located on the rear of the unit. To minimize 3rd harmonic magnetic induction distortion, the chassis is constructed out of aluminium which is of course non-magnetic, while for selected parts like air vents and mounting brackets, stainless steel is used. 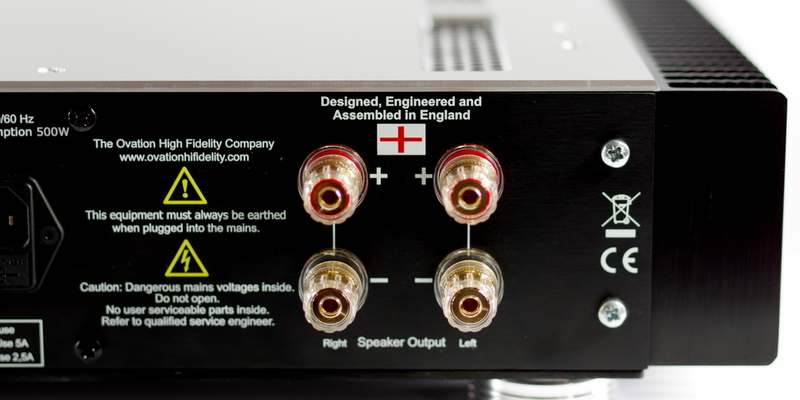 Connection to the speakers is via high quality WBT style shrouded connectors, that can simultaneously accept 4mm banana plugs and/or 6mm spade lugs. 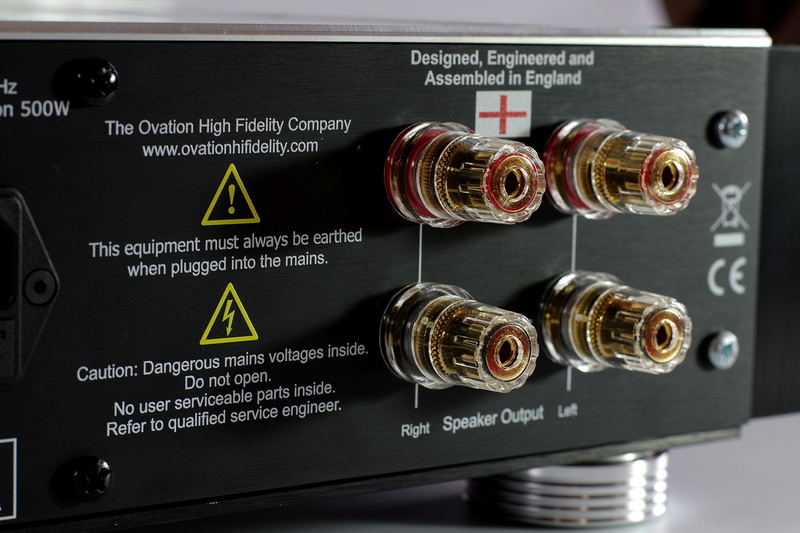 Only the highest quality, highest performance components from the worlds foremost semiconductor and passive component suppliers are used in Ovation High Fidelity products. See below for detailed product specifications. Designed, engineered and hand built in England. 5-year warranty on parts and labour. Ovation High Fidelity. Audio Equipment Engineered for Art. 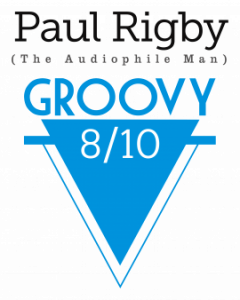 Copyright © 2019 Ovation High Fidelity. All rights reserved.